Let sleeping dogs lie, but never cats. | MEOW hear this! Let sleeping dogs lie, but never cats. Am I the only person obsessed with my sleeping cats? I must have more pictures of snoring kitties than Vegas has hookers. They’re just SO FREAKING ADORABLE when they’re sleeping (the cats, not the hookers), and just like a snowflake, I swear they never sleep the exact same way twice. There is always ONE cute little tiny change, which is why I feel the urge to snap yet another picture. Taco often sleeps sprawled as if the floor is going to move out from under him. Moosh will sleep with his fat gut in the air like a doofus. These are just my two favorite poses, but oh-em-gee there are so many others. 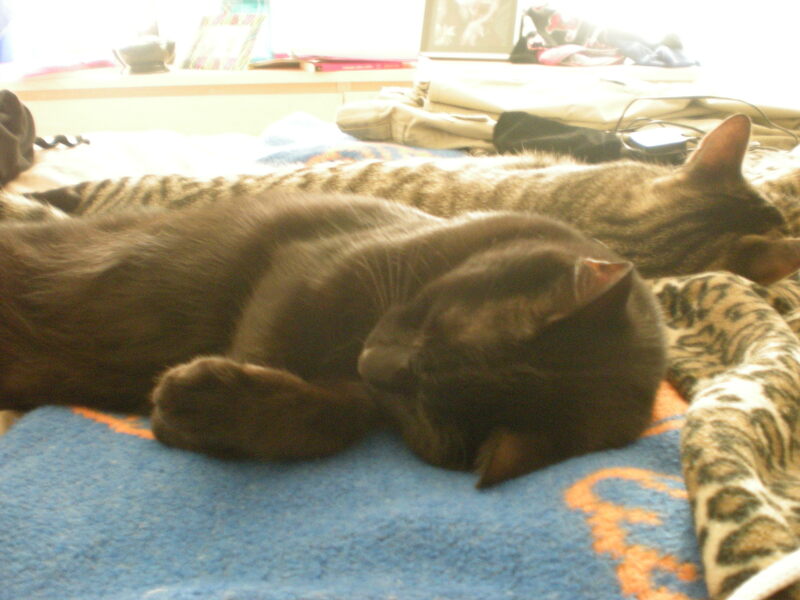 And the rare moments when I actually catch them sleeping together, that will simply make my day. 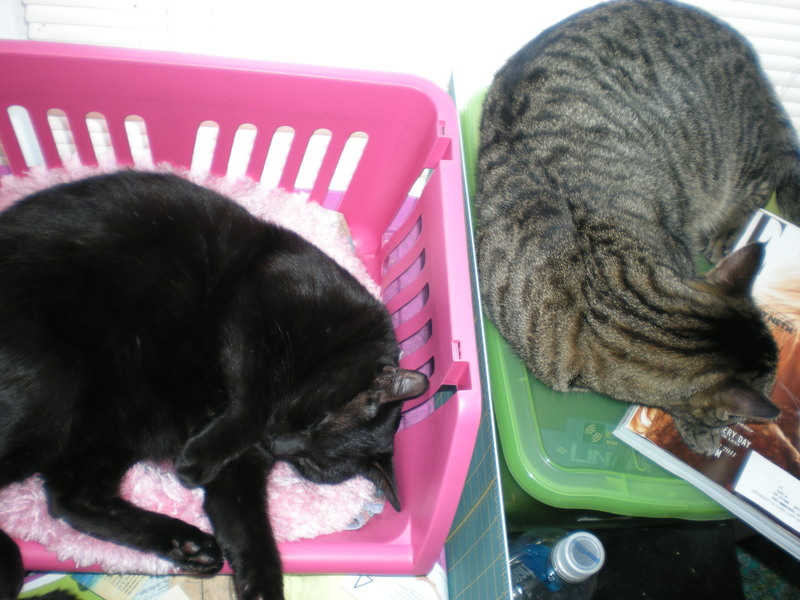 Even if they are merely sleeping in close proximity to each other, I feel as if I’ve been awarded some magical gift. And don’t even get me started about kittens. They fall asleep in the middle of things, and it’s so adorable I could die. Of course, the poses never last long, because I have to pet them and coo. But THEN they do even CUTER stretchy things and I coo some more. My absolute favorite is what I call the “backwards stretch,” where they curl their paws in and do some sort of opposite stretch thing. I think that I’ve attempted something similar but it’s not nearly as fun to watch and I usually end up giving myself a Charley Horse in my calf. Here’s where I get a little strange. If the cats have been inactive for a certain amount of time, I feel this compulsion to find them at least once an hour and wake them up. Do human mothers do this? Is this engrained? I can’t help myself. It’s not like I really think they’re dead. I just need to poke them and make sure every so often. Then I get to see them do the stretchy thing. Bonus! I think it’s entirely possible that I’m just jealous that they look so comfortable. My bed is pretty damn comfortable, but I have never felt as happy or serene as they look in even the most awkward of positions. One of my cats loves to sleep next to me in the night, with his back against my side and his feet pushing against my arm as I cuddle him. It usually ends in him scratching me by mistake while we’re asleep, but that’s ok cos he’s just so cute. Oh I love that! Cuteness like that always wakes me up. Sleeping animals are the best thing ever. And cats? Well! 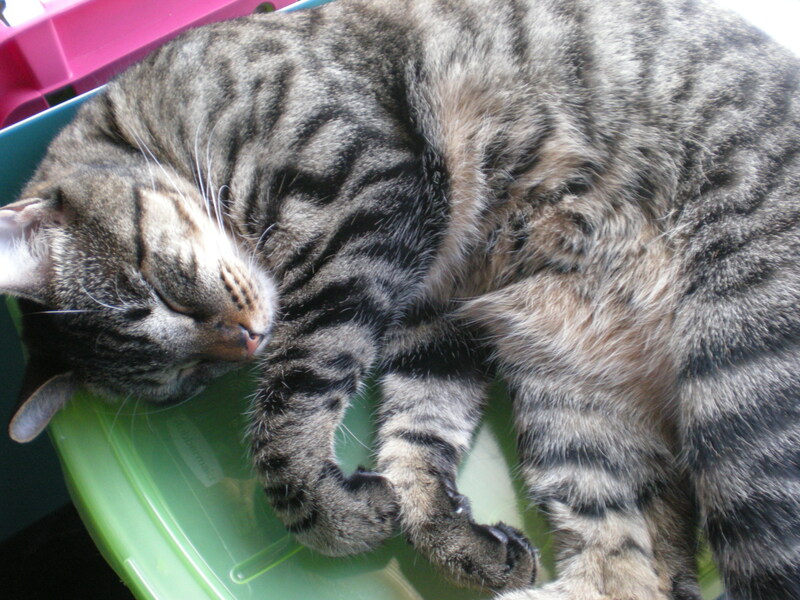 Giz sleeps in such wonderful positions and his dreams are amazing – twitch twitch twitch. Unfortunately he often sticks his paws in the air and… well, I love paws. And, because of this, he often sleeps underneath things. Underneath things I can only peer at him, not poke at him! SO HARD TO RESIST! Mine haven’t wised up that much. They try to sleep in the closets occasionally but I always know where they are and poke at them anyway.